WAIT TILL YOU SEE THE NEW FABRIC! Through the Zendesk ticketing system Bernina is receiving many wonderful praises from consumers about the latest firmware release for the machines listed above. This latest release allows compatibility with the Midi Hoop, the 72 foot/Echo Quilting Clips and the Patchwork Feet # 97/97D. Be sure to download and update your machines when these come out to keep them up-to-date! We do it at cleaning time, but the newer machines are computers and do need update. Class update: There are a few seats left in the binding class Friday afternoon. If your mitered bindings are less than perfect, or if you don't really know how to make them at all, this is exactly the class for you. The class will also include a lesson on how to apply binding completely by machine in a very attractive manner - more durable and much faster than finishing it by hand! This Saturday will be Westalee Demo Day at the Shop! Stop by and watch free motion quilting with rulers and templates. If you have seen this on the internet - or not seen it at all - and want to learn more about it, come by between 10:30 am and 3 pm to see what the buzz is all about! We have lots of sample pieces, including a small trunk show from Westalee, and will have some pricing specials available on Westalee and Sew Steady products for that day only. 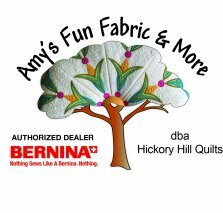 Hickory Hill has the program at the Hot Springs Guild Thursday night, 3/22 (tonight for many of you reading this in the morning!). Come on over and see what’s new at Hickory Hill! We have had to change September’s Open Sew Date like we did this month due to scheduling conflicts. Monday is not open sew day for March! I'm sorry if you missed it! Please be sure to confirm the monthly dates so you don’t miss it! More to come – but I needed to get this out so you knew about the binding class that Michelle Added and the demo. It is a cool technique! Michelle is having a bit of shoulder surgery and we will have to be re-arranging some of her classes to work around her recovery. Stay tuned!